Summer is here. Well, in some places it is, and in others it is fast approaching. Let me tell you, the absolutely best gift you can give kids for those hot summer days is definitely a lawn-based water slide. It will provide them with hours of fun and exercise, and will be a huge attraction for their friends too (so expect social summer days with those). 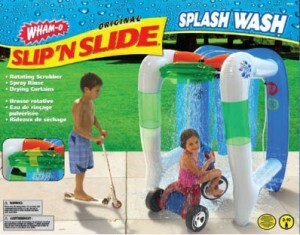 Hook it up to a garden hose and two kids can race on its slippery slides within minutes. 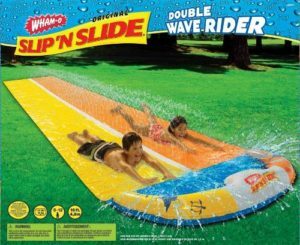 It’s simple, effective, double the fun and right now costs only $30.86 at Amazon. Another great opion by Slip’nSlide. Technically, this one isn’t a slide. It’s wet and slippery though, so I think it would make a cool addition for any summer lawn. It’s a “car wash” for kids – let them drive through on their little (non-electrical) vehicles, or just take an outdoors shower in the lawn. This one is a winner and is available at only $32.99 on Amazon right now. This one may not be very extreme, but it has the benefit of allowing for social play with two separate pools and a slide in between. Kids are bound to enjoy bumping around this one and parents can join in for some fun too. This fairly large unit is currently available at only $44.99. 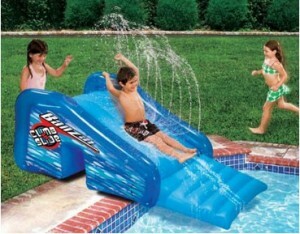 My favorite is this large bumpy wet water slide by Banzai. It can used in a swimming pool or as a standalone on your lawn. Either way, it holds the promise of hours of cool wet fun during summer time. 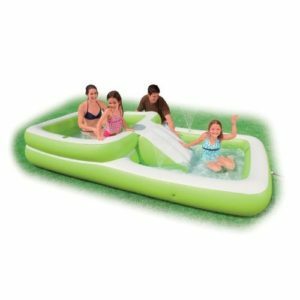 Banzai also have larger slides, but this one is available at a small price: only $49.99 for this top-quality water slide on Amazon.